Cal 20 "One design sailing for everyone…"
Cal 20’s were (and still are) inexpensive to buy, own and maintain. The base price was $3,200 throughout most of the 60’s which put her within reach of just about everyone. The cockpit is nearly 8' long and is self-bailing. Below she has four bunks, a head and storage bins. For her 20' length, she is one of the most practical boats imaginable. With the advent of expensive fiberglass resin (during the fuel crisis of 1973) and the new I.O.R. rule, Cal 20's gained rapidly in popularity. A lot of people wanted an active, simple, inexpensive one-design class boat that wasn’t going to be outdated by the next measurement rule change. Even today the resale value of a good, clean Cal 20 is approximately what the same boat might have cost new 30 years ago! Cal 20’s caught on quickly in many areas across the country. Today there are approximately ten active Cal 20 fleets in the Class Association; fleets from California, Oregon, Washington, Hawaii, and a fleets in British Columbia, Canada. Cal 20's have always been actively raced and with the large number of boats around and the strong fleet associations, the racing is very competitive. The Cal 20 fleets provide an excellent opportunity for local racing, socializing, and sharing tips and information on equipment and tuning. Many fleets hold regular social mixers and this is a great opportunity to enjoy the comradery of the Cal 20 sailors. 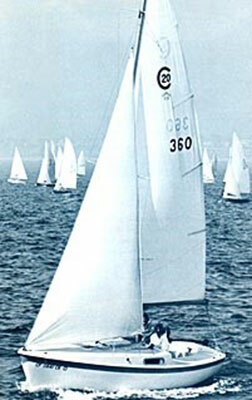 The Cal 20 Class Association holds an annual Class Championship Regatta. Held in quite a few different areas, this regatta has had as many as 50 boats racing in recent years. 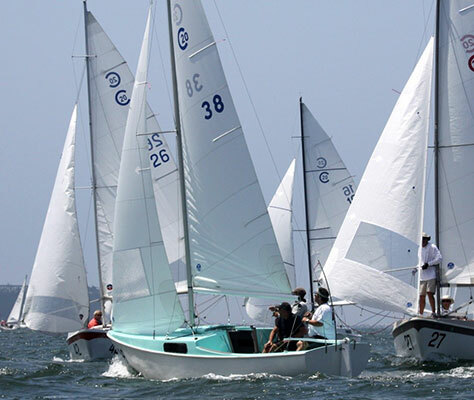 The Class Championship event includes a Junior Championship and includes Gold/Silver/Bronze fleets with separate starts to accommodate different skill sets. This format has proven popular and provides an opportunity for good racing amongst your peers. The Gold fleet determines the Class Champion and the Gold fleet typically attracts 25 to 35 boats for high caliber, one design racing. The Cal 20 offers many strong qualities for both casual day sailing and racing. One of the best qualities about the boat is her large cockpit, which is nearly 8' long and self-bailing. This makes her a very good day sailor as well as a comfortable boat to race. When day sailing or cruising, four people in the large cockpit is quite comfortable. When racing, the crew doesn't have to leave the cockpit to get their weight in the right place because the right place for crew weight is at the forward end of the Cal 20 cockpit (by the bulkhead) where the crew naturally ends up. Sitting inward with no hiking also facilitates crew comfort. This "built-in" accommodation makes a Cal 20 a much more comfortable boat to race than many other boats around today. Present day boats are rigged with easy to reach sail controls including back stay, jib halyard, boom vang, and main cunningham. 2:1 jib sheet purchase makes for easy jib adjustments without the need for a winch. Boats can be raced with either two or three crew. The Cal 20 sports a well-balanced helm with an easy groove. All these features add up to a great boat that is simple, versatile, fun to sail, and comfortable for everyone on board. Cal 20’s race under one-design class rules which include minimum boat weight, sail dimensions, and spar/rudder/keel measurements. These rules help ensure that the boats are equalized and help control costs. Used boats with trailers are very affordably priced from around $1,500 to as much as around $10,000 for retrofitted/modernized boats. It is not at all uncommon to see a “beater” boat with original 1960’s vintage patina gel coat racing neck and neck with a repainted/faired/modern rigged Cal 20. This is the inherent beauty of the Cal 20 class. You cannot “buy” your way to the front of the fleet and hence a Cal 20 sailing program is very affordable. 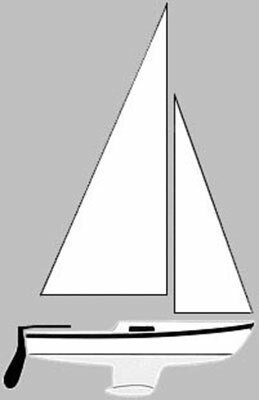 Several sailing lofts actively support the Cal 20 Class and competitive used sails can also be purchased from the more active racers. 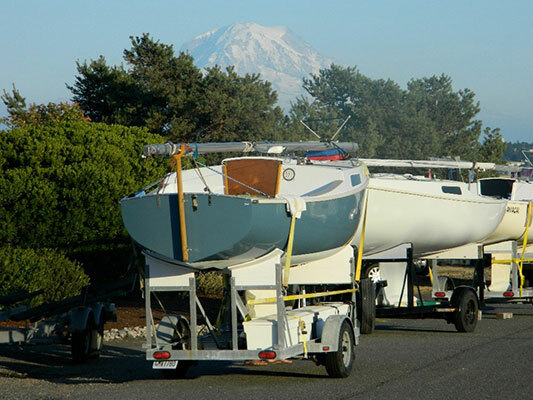 Boats are typically dry sailed on trailers and towing a Cal 20 by car is very easy. Rigging a Cal 20 is a breeze and allows more time for sailing and socializing.